I live in north Texas, and still think it gets too cold this time of year (at least it’s better than my former home, Detroit). Those in South Texas are even more accustomed to warmer weather as Shoppers brave weather and crowds — the temps, in the 50s with a wind chill of 46! Woman In TV Rescue Arrested; Warmer Winter? 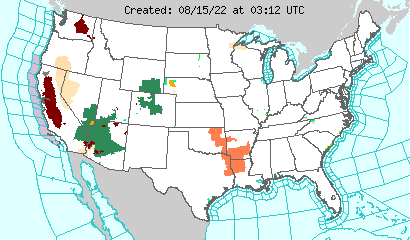 Storms march across the U.S. today. Check out Google News for stories and your nearest city in this map for live webcams and radar images. Storms In Houston, DFW; Jupiter & Moon Get Close; Solar Flares For Thanksgiving? More Powerful: TXU or TCU? Something off-topic today… Living in north Texas, we have the Mavs, the Stars, and the Cowboys, all doing well as of late. Then we have the Rangers, who need pitching — nothing new (now, this is unfortunate to me since I’m a big baseball fan. Note to self: start following the Fort Worth Cats…) This year, however, it’s great to see a team that has been doing very well over the past few years, do even better (The TCU Horned Frogs are in OU territory with a 10-0 record): Get the latest on TCU here… It’s more great news for Fort Worth, which was recently ranked as the second best city in the U.S. for beautiful women, and the second fastest growing city in the country.